Are you in a battle? 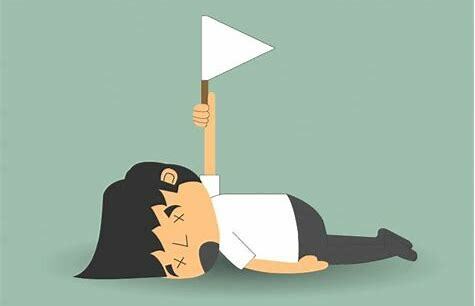 Are you weary and ready to raise the white flag of surrender? I remember when we first got saved. Our pastor was teaching on Ephesians 6 - putting on the full armor of God. He was so detailed and created such an intense and graphic picture of battles, blood, gore and war that I was overwhelmed. I said to Ken that day, who has to go through all that stuff? Little did we know - that is what every believer, every follower of Christ will go through - especially if you choose to stay on a very narrow and difficult path of faith. Yesterday's devotional spoke once again to the circumstances we are in. We are contending and believing and definitely fighting hard to overcome and step into all that God has for us. Many believers have the misconception that walking by faith means they should be able to effortlessly glide all the way to God’s destination for their lives with no hiccups or struggles along the way. But the Bible teaches quite the opposite in First Timothy 6:12. In that verse, the apostle Paul wrote, “Fight the good faith of faith….” According to this verse, the path of faith often requires a fight to see it through to completion. 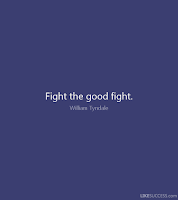 The word “fight” is the Greek word agonidzo, which refers to a struggle, a fight, great exertion, or effort. It is where we get the word agony — a word often used in the New Testament to convey the ideas of anguish, pain, distress, and conflict. The word agonidzo itself comes from the word agon, which is the word that depicted the athletic conflicts and competitions that were so famous in the ancient world. It frequently pictured wrestlers in a wrestling match, with each wrestler struggling with all his might to overcome his opponent in an effort to hurl him to the ground in a fight to the finish. The flesh that resists the will of God. The mind that struggles to understand what God has told us to do. Circumstances that seem to stand in the way. The devil himself who throws his weight against each step of faith we take. The point you must see is that Paul recognized when we step out in faith, we don’t just effortlessly glide to the destination God is directing us toward. We must fight the good fight of faith to reach the victorious position that allows us to one day hear those cherished words, “Well done!” from our Commander-in-Chief. 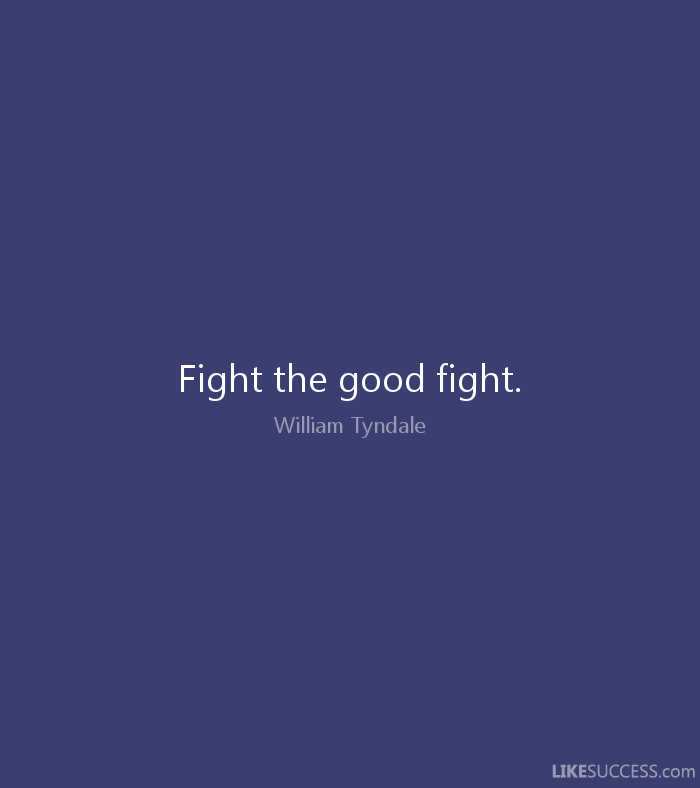 But rather than shrink from the match that is before us, the apostle Paul urges us to give this fight our best effort! He tells us, “Fight the good fight of faith…” The word “good” is from the Greek word kalos, which denotes something exceptional, of the highest quality, outstanding, or superb. In the context of a fight, it pictures one who has given his best effort to the struggle in which he is engaged; hence, he is one who is doing a first-rate or first-class job at resisting his opponents. Then Paul repeated the word “fight” a second time in this verse. He wrote, “Fight the good fight of faith.…” This second usage of the word “fight” is also from the Greek word agon — the same word he used when he referred to a “fight” at the first of the verse. It conveys the idea of one who is giving his complete concentration to the conflict and is totally focused on engaging the conflict at hand and achieving victory, regardless how long it takes or how much agonizing effort is required. It is the picture of total commitment to victory. This is a far cry from simply gliding to God’s destination for your life with no hiccups or headaches along the way! As Paul told us in this verse, anything that is done by faith will require a fight of some sort in order to win. So if you are experiencing a struggle along the path to your personal victory — if you’ve been fighting off some very real mental or spiritual assaults along the way — don’t be taken off guard or by surprise. The Holy Spirit warned in advance through the apostle Paul that you must commit yourself to giving the pursuit of God’s will for your life your very best effort and to doing whatever is necessary to finish the goal set before you! Fortunately, only the bottom three points are applicable at this time. (LOL). -Circumstances that stand in our way - Provision! We know God's word - He provides! Where He leads, He'll meet the need. Where He guides, He provides. We are thankful for His amazing provision...... and we are believing that He will do the miraculous to get us to our next destination - D - E - S - T - I - N - Y! He is faithful and He won't fail us! -People who oppose us. - Now, that's a good one! Years ago I read a book by Bruce Wilkinson, The Dream Giver. He talked about "border bullies". These are friends and family who oppose your dream and speak doubt and discouragement into your situation. They don't do it intentionally (at least I hope not), but they definitely think we've gone bonkers and cannot possibly imagine God coming through for us - and that He spoke to us such a Big and Crazy dream. We feel differently. If it isn't big & hairy and audacious and something we can do in our own strength, frankly, I think it wouldn't be from the Lord. He only works in exceedingly abundantly more than you can hope or imagine ways. What we've come to realize is that our dream is just that - OUR DREAM! It's the dream that God placed in us and we cannot expect others to grasp it. What we hope for at best, is that there are a few of you (and we are thankful) that support us through prayer, conversation, encouragement and donations to help us walk this out in faith. I would say we don't choose this path - but we do, because we choose to be obedient to the Lord. The short rope God has us on - trusting Him for day to day needs as well as sustaining my health is quite humbling and difficult. Having people consistently question us and tell us that we need to do this or that, can be a huge blow to our faith..... and is sure obvious opposition. Thankfully God is turning these instances for good and growing our faith....Yea!!! For the record, we consistently go to the Lord for wisdom and direction and seek a multitude of counselors. We are not lone rangers. We are always willing and open to listen to good, sound advice - and we prefer "spirit filled and spirit led wisdom". -The devil himself who throws his weight against each step of faith we take. - This is definitely what our former pastor was talking about in that early sermon. It often feels like we take one step forward, see some positive momentum and then suddenly we feel two or more steps in the opposite direction. The one thing I have realized is this is growing our faith. Though it feels quite the opposite, I can see huge strides. Praise God! K Ken - For the last month or so Ken's hours were cut down to 2.5 days - maybe 18 hours a week. Fortunately for at least this week and next, he has been scheduled more hours. Please pray for continued provision. M Michele - I have been having extra pain- not sure if it's because my hips are out of whack - but pain in legs, low back, hips, feet, tingling too. The good news is that I borrowed my sister's sleep tracker and I am actually getting some sleep - only 3-4 hours of sound deep sleep and the rest intermittent light sleep, but I'll take it! I had just changed to a new sleep supplement that works on lowering cortisol for those with adrenal issues. Pray the sleep continues and please pray for pain to go! Ministry - our Thursday nights are going great. We spent several months teaching on Transformational Prayer - an inner healing ministry. Now we have a lady who God moved here from California - seriously - and she is teaching Sozo - another form of inner healing ministry. We are helping to facilitate and get a healing center set up in the area - and form some healing teams. We were blessed with a 2nd vehicle recently - that now allows me to leave the house, when I feel up to it, for the first time in 2 years without. Whoohoo! Thank YOU so much for your ongoing support, prayers, love and care for us and our ministry. We are honored to be able to pray for those who reach out to us. Please let me know if you have any prayer needs. For those who have been reaching out, thank you! I am praying for your requests.